"I'm going balmy trying to keep straight in my mind what is and is not a Lladró product. How can I tell whether something marked Made in Spain is a Lladró or not?" Of these, only items marked with a Lladró or a NAO mark are still in production. For now, you can safely assume that anything that has a name other than those in the above list is not/has not been affiliated with Lladró. 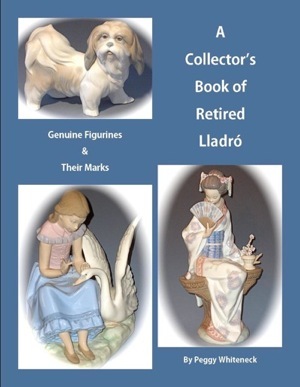 "I recently inherited some Lladró figurines, a number of which have impressed or incised marks that say 'Lladró Made in Spain' or 'NAO Made in Spain.' Somebody recently told me these are fakes because only items with the Lladró blue backstamp are authentic. This person was quite adamant about the point. Is it true?" No, it isn't. But you can pick up some great bargains trading on the ignorance of such "experts!" Items with impressed or incised marks simply predate the use of the backstamp, making these non-backstamp marks the older and pre-eminent of the Lladró marks. I've gleefully snapped up these older items in antique shops after other collectors have been there before me and assured the dealer adamantly that the items are fake. At left, this typical example of an "impressed" mark Lladró can be found on early-issue catalogued items as well as on the oldest and rarest models numbered by decimal point. Note the characteristic formation of the initial L, whose tail is elongated to extend beneath the entire name. This particular example includes the Spanish word for Spain (ESPAÑA), but other examples do not. The old canard about the Lladró blue backstamp was actually (and, it seems, inadvertently) fueled by Lladró itself, when it came out with a marketing slogan in the 1980s: "The Lladró blue backstamp is your guarantor of authenticity; refuse imitations." The company was engaging in legitimate self-defense against a number of counterfeits and copies that had begun to circulate on the secondary market, but it appears not to have realized that the slogan could also be used to impugn the integrity of its own pre-backstamp marks. "I keep seeing these eBay listings that say such and such a brand name is a 'subsidiary of Lladró' but they sure don't look to me to be as well modeled as Lladró. What's your take on this? You're developing a "good eye!" Once you develop the ability to recognize the characteristics of a genuine Lladró model, you seldom make the mistake of assuming a competing brand is a Lladró. While we're at it, eBay is a good source of "raw" research; where would we be in the discovery of new models and brands in Lladró if it weren't for eBay? But eBay is also a source of great misinformation, as bogus data gets passed from seller to seller accustomed to cannibalizing each other's auction descriptions. In short, just because it's in some eBay auction description doesn't mean the seller knows a thing about the item in question. Sometimes eBay can be a good source of comedy as well as information. My collector-friends and I have had quite a few hoots and hollers and guffaws about some of the junk that's represented as Lladró on eBay. "I have a couple of Lladró figurines that have the blue backstamp with a full logo on it but without the © DAISA copyright notice on them. Does that mean they're fakes?" Nope, it just means you have older examples of the backstamp. The copyright notice wasn't added to the mark until around 1978 (© 1977, as the copyright year in the notice is generally the year prior to the actual issue date). 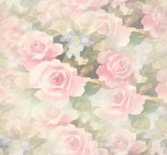 So backstamps on anything made prior to that date will not have either the copyright notice or the registered trademark sign after the name. 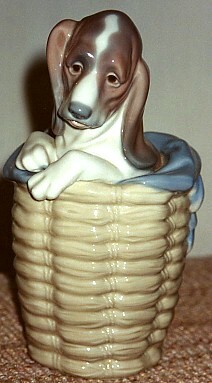 Lladró's "Dog in the Basket" (#1128) was retired in 1985. This example from my own collection has the original blue backstamp, no trademark sign, no copyright notice - and no accent on the O. No negative impact on authenticity - but, at least at this point in the evolution of market sensibilities, no premium value, either. "I've seen several Lladró models marked with a blue backstamp from which the accent on the final O of the name is missing. At first I thought these were fakes, but now I'm starting to wonder because I see so many of these marks. What gives?" It's an oddity of Lladró production history that the accent was left off the O in the company's first backstamp. Incidentally, this led to the widespread, and still common, mispronunciation of the name with the accent on the A in the first syllable - since even in Spanish, the accent would fall there unless there were an indicator otherwise. For some reason, it took the company quite a while to correct what amounts essentially to a spelling error, and one that affects name pronunciation at that. Consequently, many examples of this first backstamp can still be found on the secondary market. The first and unadorned blue backstamp (pictured at left) is quite authentic. It also tends to bleed a bit, as in the "flow-blue" example here. "Wow! In other collecting fields, an error like that on an item would make it instantly more expensive. Wouldn't that be the case here?" At present, the market doesn't recognize a premium on items marked with this first backstamp (perhaps because so many examples can still be found on the secondary market). Nor does it recognize a premium on older impressed/incised marks such as the one also pictured on this page. However, because I anticipate that, at some future point, the market will want a way to distinguish older from newer items in Lladró's prolific production and that the mark will eventually come into play as one means of making such distinctions, I do make the acquisition of items with early backstamps a priority of my own collecting (consistent, if course, with my own thematic interests).